I began my cards by choosing a sheet of watercolor paper, plastic packaging and a few colors of mists and paint. I began by taping my paper down and I just began spraying and layering color. 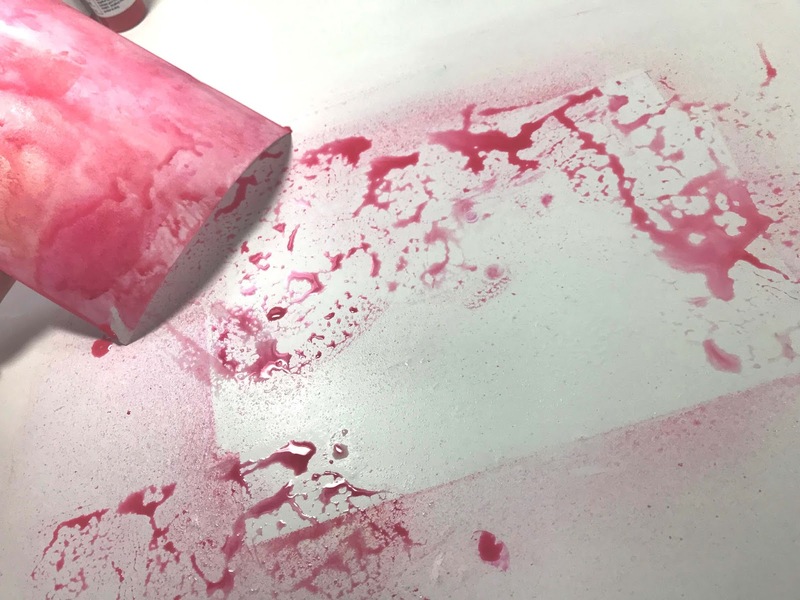 I wasn't concerned if the colors were dry in between application because I wanted them to move and mix together. 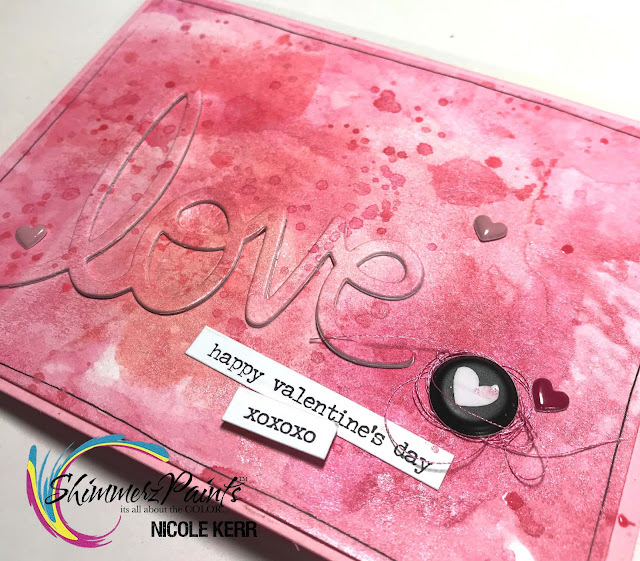 I found that when I was creating the first card, "XOXO," I had a lot of mist on my craft sheet that didn't make it to the paper. 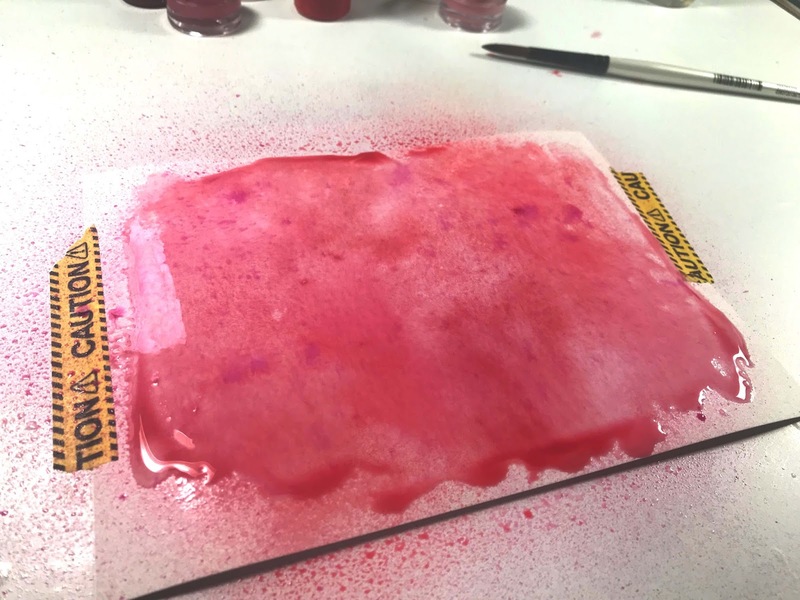 This lead me to cut down another sheet of watercolor paper and use it to pick up what color was on my craft sheet. 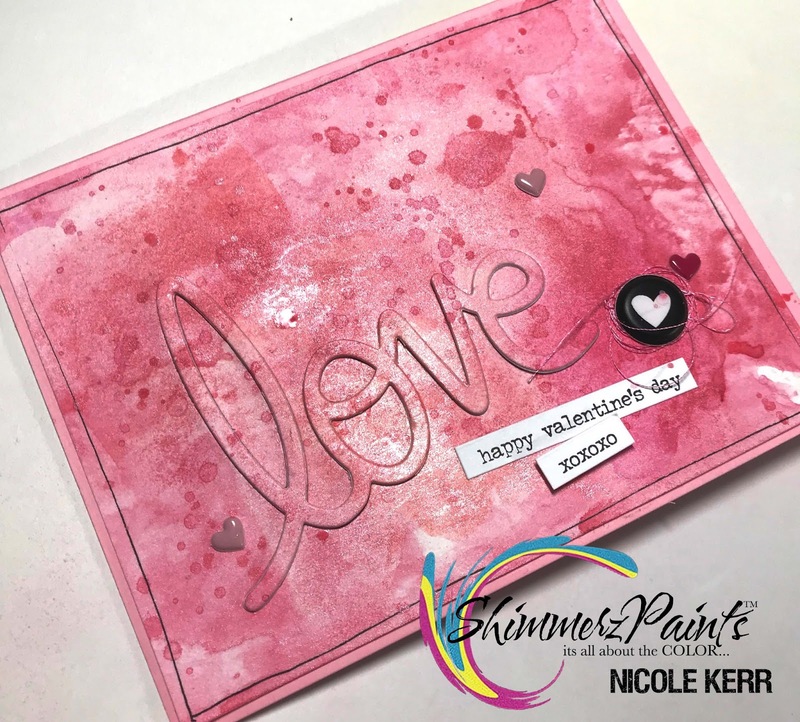 Those layer's of color were created on the "Love" card. After a few layers of color on each piece of watercolor paper, I did decide to let it dry and layer more color on top. Once all layers were dry, I chose a couple dies from my stash and began running each piece of watercolor paper thru my Cuttlebug. On my first card, I chose a heart die and an XOXO die. 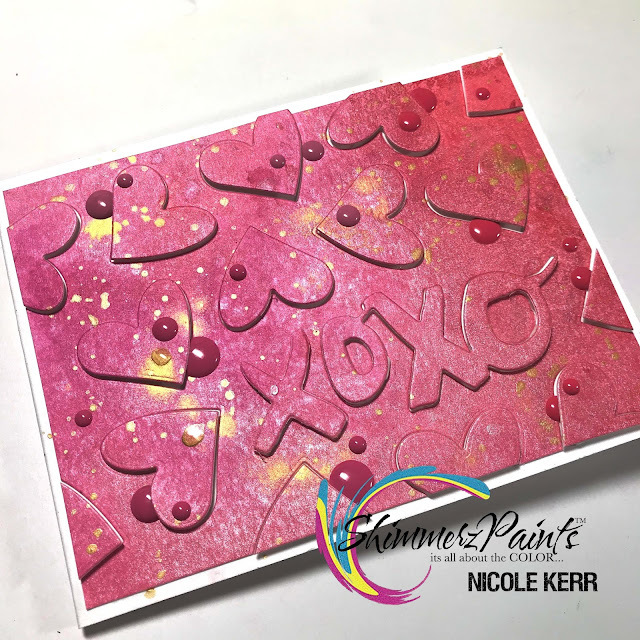 I first cut the XOXO where I wanted the focal point of the sentiment to be, then followed by cutting the hearts on various angles. Once all of my pieces were cut out, I added foam squares and popped them up, making it look 3D. To finish off the first card, I splattered Inklingz in Miner, Miner 49er and added various color coordinating enamel dots all over. The second card, which happened completely unplanned and probably my favorite of the two (funny how it seems to always turn out that way), I die cut the word "love" from the watercolor paper. I then placed all the pieces back in where I cut it so I could glue the centers of the "l," "o," and "e." Once those were glued in place, I removed the "love" die cut again. I had cut that sentiment an additional 3 times out of regular white cardstock and glued all three of those together and the final water colored one on top, making it looked raised as well. I then grabbed just a few stickers and thread from my stash and drew a thin black boarder around it and called it done! ...and finally the best part! 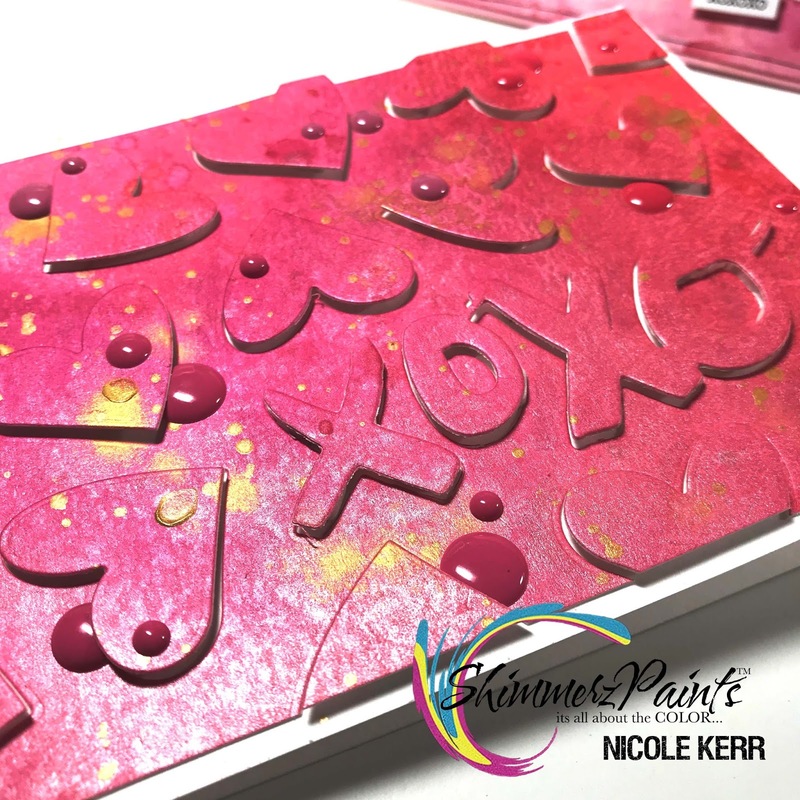 Links to where you can purchase these beautiful colors! Don't forget to mention my name in the comments section during check out to get a free product! I hope you had fun and got inspired!